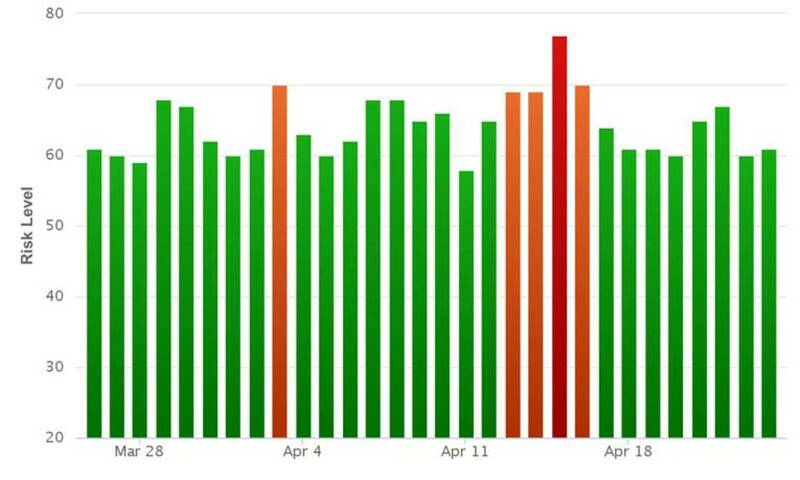 The SERP trackers showed a spike in volatility in the search results around the 13th — 16th April, with either change to the core algorithm or some kind of testing suspected. Published: Apr 25, 2016. 10:42 +0100. The SERP trackers showed a spike in volatility in the search results around the 13th — 16th April, with either change to the core algorithm or some kind of testing suspected. Throughout the following week, while the trackers remain quiet, there have been a few grumbles in the SEO community that the volatility has continued. I am pretty sure when we start rolling out we will have a message to kind of post but at the moment I don’t have anything specific to announce. @jenstar Yeah, but I just can't promise it, which is why I phrased it that way. Sometimes teams like to test the water silently first. Testing of the New Penguin Real-Time Algorithm may explain some of the volatility of late although we are just wildly speculating at this point. Last week around the 20th April, Amit raised the possibility of an ongoing update with Gary Illyes. Gary responded in a rather vague way, which in itself is not unusual as they don’t normally like to comment on updates, but equally does indicate something is going on. Traffic continues on a drip basis. never more than four at a time. Unthrottled traffic used to surge and flow naturally. No conversions for going on 48 hours. Used to do 15-20 /day on only marginally higher volume. As is, you might as well pull the plug. Google AdWords is still on, yet no conversions. At least someone is making money … by selling thin air. Yep, weekend far below average here. The fact we are seeing such similar patterns tells us that there is something in the works here that Google has not let on yet. I don’t know they could be testing this for 6 months and still not have figured it out or become clued in to what they are doing. Apr 1 - — 9 massive conversions. Since then poor (with few exceptions) and finally this weekend is totally dead. The interesting point is that there is a theme that in some cases while the traffic remains largely the same, complaints are revolving around the quality of traffic received. Is this because Google is getting better at working out a user’s intention for long queries (RankBrain) and directing them to more appropriate websites? Is it that these webmasters competitors deserve the high-quality traffic? It is hard to say, but Zombie Traffic has long been a concern of some webmasters, even though John Mueller has denied this is a thing. It is useful to look at the various SERP Trackers to see the impact and scope of any recent Google Update. This can help you determine whether your SERP changes is due to a core algorithm update change, or whether it might be related specifically to your website or small group of websites. We can see clearly that the main volatility was around the 15th April, with further minor spikes around the 21st and 22nd April, although as you can see this type of movement is not unusual. The Grump ratings clearly show a level of increased activity this last week, which clearly matches the increased level of chatter we are seeing. Surprisingly, MozCast is relatively quiet this past week with the exception of the movement around the 14th and 15th April. This is quite surprising, and would indicate that the movement is not as widespread as the other SERP trackers would imply. Whenever your rankings, traffic or conversions drop it can be very easy to panic. Don’t. These could be just tests, and the full impact of the recent volatility may never be rolled out. If you adhere to the Google Webmaster Guidelines and focus on high-quality content, chances are you won’t have issues with the Core Algorithm or Google Panda. If, however, you have undertaken in some dubious link building practices (whether directly, or via an SEO company on your behalf) we would recommend you investigate your link profile. We know that the Penguin Update is coming soon, and although it will be changing to “Real-time” we suspect that recovery from any penalty will still take several months at least. Companies such as Cognitive SEO can help greatly with the investigation of your link profile by incorporating all the data produced by companies such as Moz, Ahrefs, and Majestic. It also prepares the disavow file for you to submit to Google very easily. It is a service we used when we were hit by negative SEO a couple of years ago, and one we would highly recommend.